Keep in mind this it not the only way that corporate credit can be used. This is only one example of many possible methods. Also, keep in mind that the step-by-step how-to guide and the wording of your written offers, and the details are covered in the training courses that are included with shelf corporations with real estate funding assistance program. Note: Beware of organizations in this day and age that say you can get a company that already has credit lines attached to it. If you want to acquire an aged company, give us a call. After you acquire it from us we can help you can build credit on it. 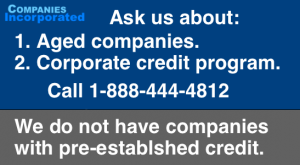 PLEASE NOTE: We have new programs instead of this one in which we create corporate credit profiles and assist you with building business credit so that you can open credit lines for your aged company. The lending environment has changed so we do not currently offer the program exactly as described here. The information below is a combination of personal knowledge and information from the participants in the project. Two of our clients in Tacoma, Washington, a husband and wife named Dwayne & Janet Anderson, wanted to buy land, build two houses, and sell the houses for a profit. After acquiring a company from us they attended the same training courses that we offer on how to use their corporate credit line. They then made an offer on two lots for $125,000 a piece which was financed by corporate credit. The training course that goes along with your company with the credit assistance program will teach you how Dwayne & Janet’s were able to purchase the land fully financed by our corporate credit program hardly a dime out of their pockets. Actual Picture of Building Lot of Our Clients, Dwayne & Janet, That They Acquired Using Our Corporate Credit Program. The construction loan we helped Dwayne & Janet acquire put money in their pocket upon buying the land. So, money from the credit we helped them to obtain is disbursed to purchase the land and more is disbursed as the project develops. In this case, upon buying the land, the lender funds enough to pay the seller of the land plus a bit of extra money to go in Dwayne & Janet’s pockets. You will learn this technique in the training course, how the write the offer and where the find the deals. Again, Dwayne & Janet are not required to make payments on any mortgage until the property sells. The Corporate Credit Program and the structure of the offer was able to fund enough to purchase the land plus about $25,000 per lot was able to go into Dwayne & Janet’s pockets. Since they purchased two properties at once, they were reportedly able to pocket about $50,000 up front. You will learn how they did it in the accompanying course. Once the permits were acquired, which our courses teach, we found Dwayne & Janet a builder. The lender disburses the first draw (payment) to the builder. Still, the project is fully financed by the corporate credit and no money has come out of Dwayne and Janet’s pockets. Dwayne & Janet did not need to know how to build a house. They had no experience in building. They simply followed our training course and then hired the builder we found for them. In addition, full-time developers with decades of experience have also been able to benefit from utilizing our program. After the framing of the house is finished, the lender disburses more money to the builder from their construction line of credit. Now the property is complete. The market price came in at $385,000. a. $125,000 to buy the land – fully financed by the lender and seller financing. b. $25,000 extra loan disbursement that went into Dwayne & Janet’s pockets up front when purchasing the land. c. $99,000 in construction draws. Total: $224,000 that is fully funded by loans. Market price: $385,000Total projected profit before closing costs: $161,000 (which is $385,000 – $224,000). The entire project was able to be purchased, built and sold using the company credit, reportedly, without a dime out of Dwayne & Janet’s pockets. The construction credit line covered all expenses. To order an Aged Corporation or Shelf Corporation with Credit assistance training, also referred to as shelf corps with credit program or shelf corps with credit package or shelf corps with credit lines (lines that are subject to lender approval and not traditional cash credit lines) or information about aged corporations with established paydex scores, please call 1-888-444-4412, or internationally at +1-661-253-3303 and speak with one of our specialists who will gladly assist you. Please call Monday through Friday between the hours of 7:00 AM and 5:00 PM Pacific Time. THIS ILLUSTRATION IS FOR EXAMPLE PURPOSES FROM AN ACTUAL CUSTOMER. YOUR RESULTS MAY VARY. IN THIS EXAMPLE BOTH PROPERTIES WERE REPORTEDLY SOLD TO ONE INVESTOR FOR A PROFIT AT A QUICK SALE PRICE LOWER THAN THEIR ORIGINAL LIST PRICE AND AT A DIFFERENT AMOUNT THAN PROJECTED PRICE ABOVE. FROM OUR UNDERSTANDING, A GREATER PROFIT AS ILLUSTRATED IS EXPECTED TO BE OR HAS BEEN REALIZED BY INVESTOR WHO PURCHASED PROPERTY.